The official tree of the state of Ohio, the buckeye tree is grown as an ornamental or specimen tree for its foliage, large hanging panicles of yellow blooms, spiky seed fruits and its bright red and orange autumn foliage. 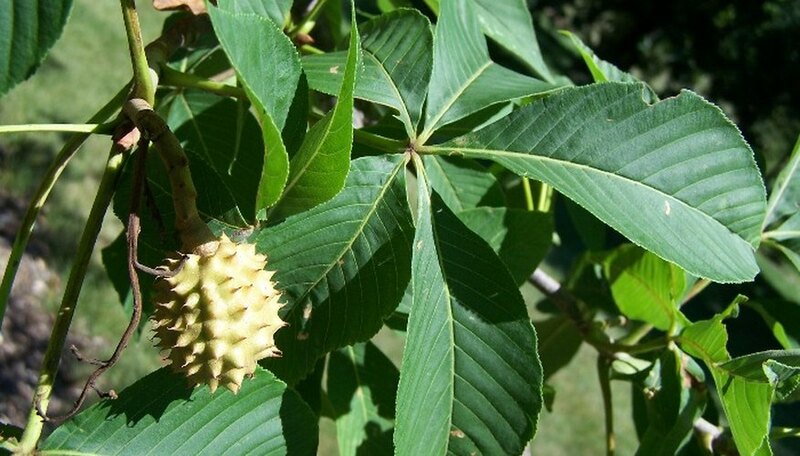 Typically grown from seed, buckeye trees will mature and begin flowering and fruiting in three to five years. Harvest your buckeye seeds for planting as the ripe fruits fall to the ground in September and early October. Gather twice as many fruits as you want mature trees as the seeds have a roughly a 50 percent successful germination rate. Remove the outer spiky husk by cutting an opening with a garden knife and peeling back the husk. Place the seed in a damp paper towel or plastic bag so it will not dry out and plant it as soon as you can. Select your planting site and till up the soil well to a depth of at least 10 inches. The seeds will more easily be able to penetrate and root in loose soil. Bury the seeds 3 inches deep in the soil, spacing the duplicate seeds at 10 inches apart. Cover with the soil and water them well. Water your buckeye seed when green shoots emerge and begin to look like leaves. Establish a regular watering regimen that leaves the soil lightly and evenly moist but not wet. After the first year or so you can thin the duplicate seedlings, selecting the healthiest, most vigorous looking specimens and simply pulling out and discarding or transplanting the extra ones. Feed your buckeye seedling and tree lightly as overfertilization does not seem to induce healthier or speedier growth. Apply a balanced 10-10-10 formulation around the roots of the tree after watering and then water the fertilizer itself in well. Follow the dosing instructions on the product label and if anything, err on the side of lighter doses. Mulch your buckeye seedling and young tree with an organic material such as compost, leaf mold, shredded bark or cocoa hulls to help preserve moisture, keep down weeds and protect the developing roots.